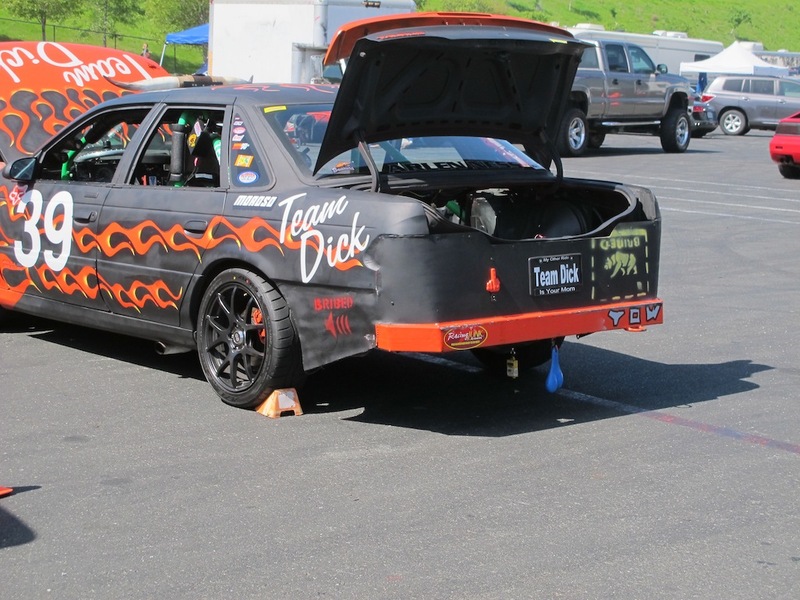 We found ourselves again passing through the San Francisco Bay Area around the time a friend was going to be both the mechanic and a driver for a 24 Hours of LeMons team and we were invited to attend. 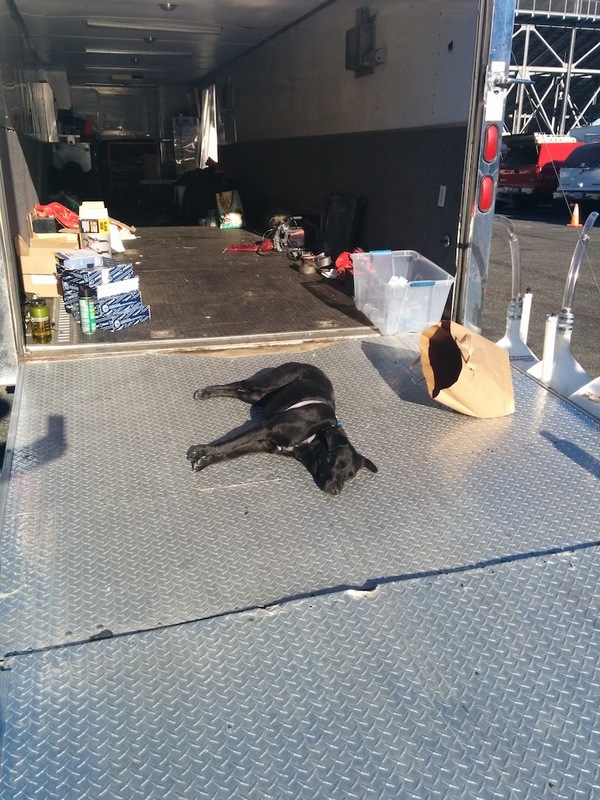 As it is a full weekend we decided to “go native” and sleep Friday and Saturday nights in the team’s car trailer. They are actually quite roomy once the two cars are out and with only a hint of carcinogenic chemicals wafting about. Good fun. 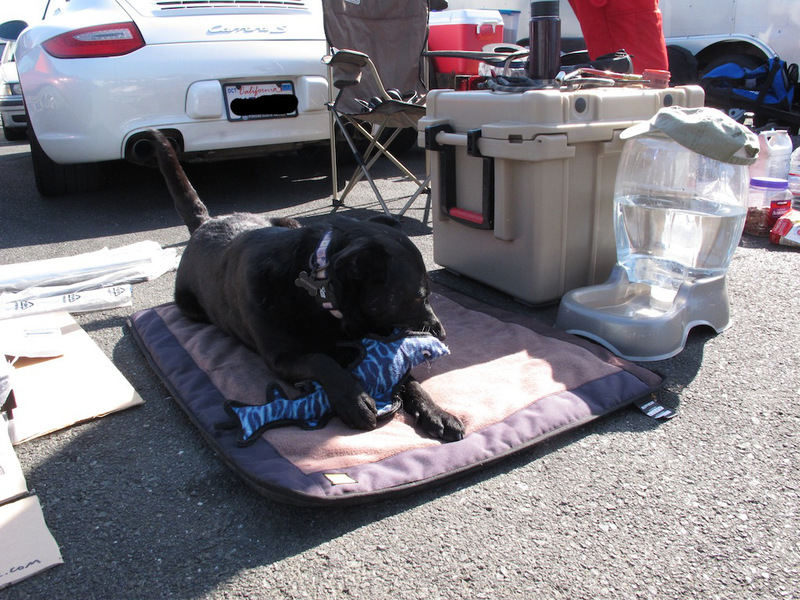 We set up Willow’s Ruffwear pad, (almost) endless water bowl and her favorite toy shark right next to my comfy camp chair and my Pelican cooler full of frosty beverages and then proceeded to watch the madness. The team next to use was having a bad weekend and spent all of 15 minutes on the track the entire time. For us that meant watching them start up the car, listen to it scream like it is being vivisected, put it into gear and maybe get it down to the end of the row before having to be pushed back to their spot where long-winded and loud words were bandied about and fix after fix were attempted. Much fun from the peanut gallery. Meanwhile, Willow spent most of the time intently trying to dismember her shark in between bouts of glorious attention from strangers walking by. 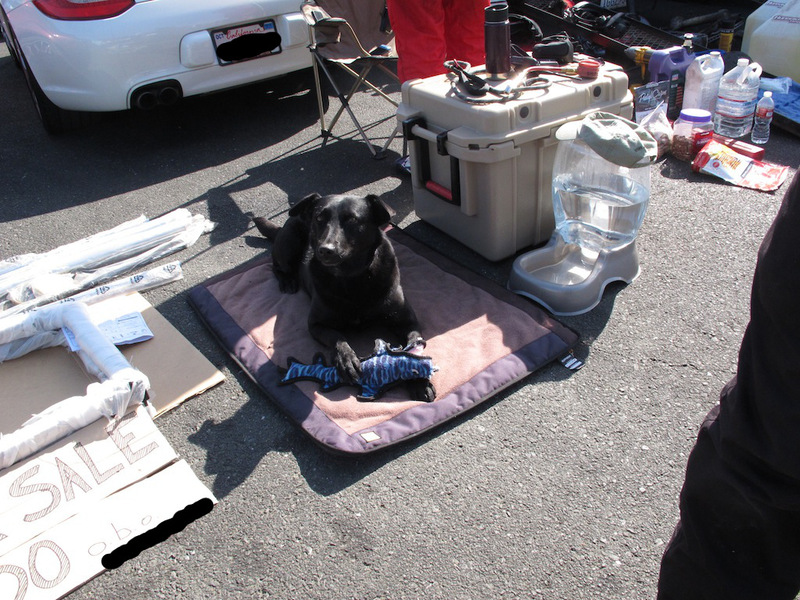 She also took numerous sun baths on the hottest surface she could find, the open rear ramp of the car trailer. A pyrometer told us it was hotter than the asphalt itself. After a full day of fun in the sun the whole team went into Petaluma for dinner. A few left to go to their nearby homes or hotels but Willow and I went back to the track and set up inside the trailer for the night. Other people had the same idea in mind and the after dark the after-hours party is wide-ranging and diverse. Members from different teams hanging out and swapping stories and tips and continuing to wrench on their car for the second half of the race the next day. Dogs are let off leash and Willow romped up on a hill with a couple of new friends for about an hour before coming back completely pooped and ready to hit the sack. The next day things start up bright and early and we took in some of the race from several areas around the track. For being in a place which is the antithesis of the usual non-crowded, quiet and scenic places we gravitate towards this was still a fun experience. Willow got an amazing amount of loving from friendly strangers and met a few nice dogs while I got a close-up look into the world of racing on a budget. The crowd was friendly and team members open to answering my many less-than-smart questions which was kind of them. If we are ever in a position to attend another LeMons event we will make every effort.